Be able to swim & sustain himself in the water (with & without fins). 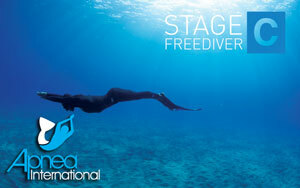 This course is designed to improve the freedivers knowledge in the more advanced aspects of freediving. During this course we discuss aspects of deep Freediving such as deep equalisation, packing, mouth-fill , exhale diving ( FRC) and variable weights. This course concentrates on the students “weak spots” and tries to fix them. We discuss mental management systems and advanced breathing techniques. The dives will be videoed so that we could debrief them on land for further improvement.